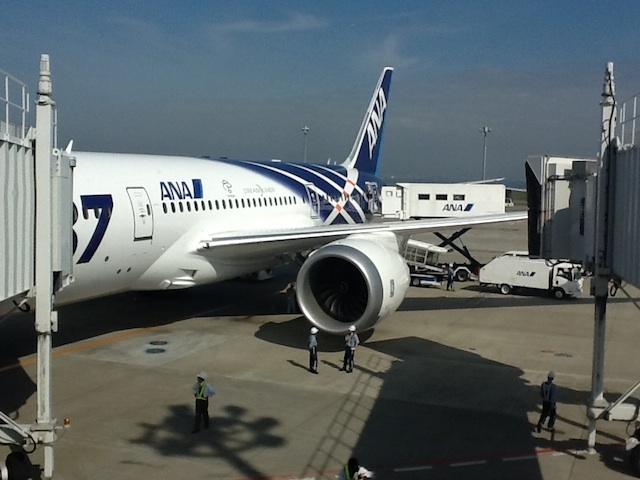 So I had a chance to fly the all new ANA Boeing 787-8 Dreamliner from the Boeing company. It was way cool, but I have a few comments. As it turns out, this was aircraft JA802A, the second aircraft ANA received. I was told that this was its maiden voyage with paying customers from Tokyo-Haneda (HND) to Okayama, Japan (OKJ). It had only flew around on 29 Oct. but did not land at OKJ. I was happy to fly it on the round trip flight and getting a beautiful view of the city of Okayama form the air and seeing the airport at least :-). Its a beautiful airplane and congrats to Boeing and ANA for making it all happen. I’ll add more pics as time progresses as I have plenty:-). Here are my findings of my journey accompanied with some pictures. Atmosphere – I did not notice any difference in the cabin atmosphere, but then again I have no issues with my ears popping when I fly. The windows – So this is the best part of the plane; they are huge and automatic, well, kind of :-). You can adjust them electronically, no shades. I have some pictures below and I’ll share a movie later. It was fun watching people play with them too. The toilet with a window and all the features that comes with it, such as the auto flush option 🙂 Also, the water controls are auto, which I like and not so like. Special toilet for the ladies – This is a cool touch and I’m told by ANA that this toilet has a bidet in it. The Japanese loves their toilets :-). It one of my favorite things about Japan. I always looks like you have to have a degree to install one of them. The cabin – Its nice and pretty high and the lighting is pretty cool. 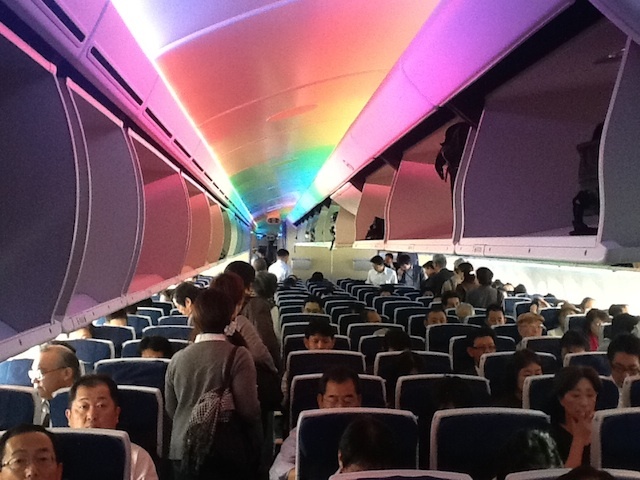 ANA has a blue mood for takeoff and landing and during boarding and exiting, they throw in a rainbow colored set which is cool. The entertainment system – Although this is not a function of the airplane; but ANA could have done crap with it and they did not; thanks. The extra armrest in the middle of the plane – So the seats in the middle of the plane have their own right and left armrest, so the middle seat people only have to fight with the folks in the aisle :-). I personally think this is a mathematics thing as opposed to otherwise, but its cool if you ever have to sit in either of the two middle seats. The overhead bins – They are easy to open and slope upwards; once they are open it makes it easy for me to get up and stand up straight. Not so much when they are open though; but that’s O.K. The inner ones are a tad too high for some flight attendants to close. You might run into an issue of your bag slaving forward though as the lip is about 2/3rds ways from the top of the bin. Seat Width – ANA did a good job on that; I was quite pleased. Will see what the other airlines do. In-seat power – Every seat gets one; no more sharing with the neighbor who may not want to share. Configuration – Well, its a 2-4-2 setup with that double armrest in the middle. Just wondered why they did not do 3-3-3. But its cool. The inner bins – the poor flight attendants have some difficulty reaching them as they are so much higher than the ones on the sides. There is a step built into each seat, but it only helps a little. The seat recline mechanism – Once you press the seat recline button, the seat cushion moves forward and the back of your seat moves downward. This is a pretty cool design, except that if you are 6′ 1″ tall like I am, now you have no where to put your legs. In ANA’s defense though, the majority of its customers are not 6′ 1″ and the seats have a decent recline already build in to compensate. 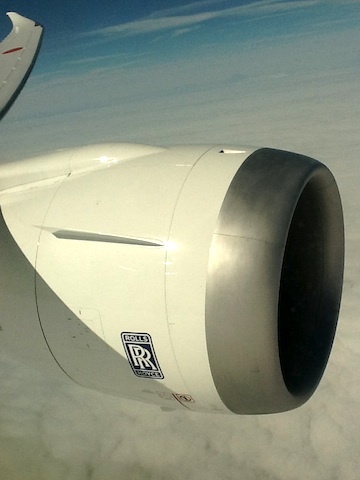 Aircraft Noise – On landing, there is quite a bit of noise which is connected with the wing mechanism. Its a combination of noises that occurs when the wings changes shapes as its being configured for landing. I was sitting behind the wing, so I don’t know what its like forward of the wing. All in all, I had a great flight and thoroughly enjoyed the experience. If you flew it, what are your thoughts? If you did not, what do you think of my findings? 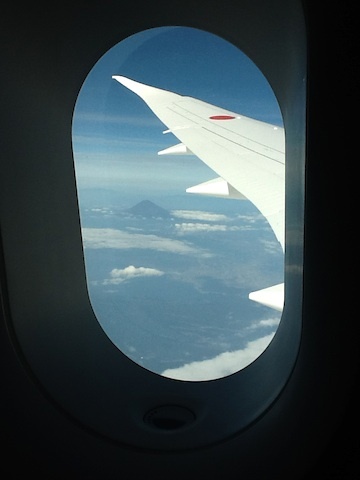 My friend Seth also flew the Dreamliner, but on 3 Nov. Here is his 787 Dreamliner report. Had a hard time with armrest recliner button on the Dreamliner recently . It just wouldn’t recline the seat and on further persuasion the button decided to lodge itself further in and not come out . I suppose that would be nice job for the engineers . The headphone jacks also seemed to have intermittent connections despite changing 3 headgears . I wonder if Boeing have anything to say about this flagship ? Umm Manolios, sounds like a seat manufacturer issue not Boeing :-). Sorry that was not a stellar experience. -What you’re talking about here are the flaps. The wing does not change shape. Great report. I’m booked on HIJ-HND this evening and am super excited to give it a fly. It was a fun flight. Overall it was incredibly comfortable and a very nice trip. I’m not sure why you’re hating on the 2-4-2 layout versus 3-3-3 but, except for lie-flat coach, I’m not sure there’s any reason the 3-3-3 would be better. 3-3-3 would likely mean narrower seats since it’s 9 across versus 8 across in 2-4-2, plus the window seat in 3-3-3 has to get over two people to get to the aisle, versus in 2-4-2 you’re never more than one away from the aisle. I can’t think of any reason someone would prefer 3-3-3 over 2-4-2. 2-5-2 I’m used to from flying on various US DC-10s, L-1011s, and 777s. I like it as a window seat fan, I’m still just one away from the aisle, but I understand the argument of 3-3-3 over 2-5-2 is that with 3-3-3, the people who have to get over two people to get to the aisle at least have a window, versus in 2-5-2 they’re the ones in the very middle of the cabin.